Since I started working with entrepreneurs, I’ve had the opportunity to help a variety of business owners tackle the beast that is Pinterest. And although each business has had its own unique challenges with the platform, I’ve found several common issues that pop up each time - even with seasoned Pinners. Let’s go over those issues and chat about how you can go about fixing them! 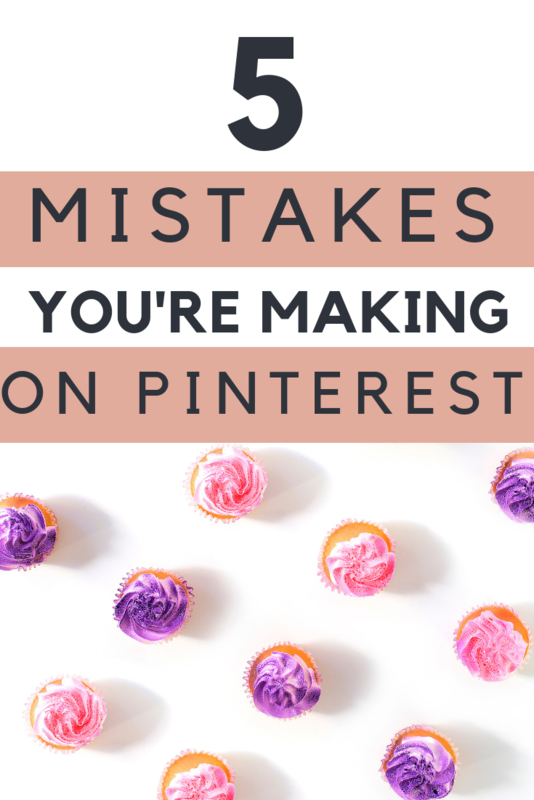 The biggest and potentially most damaging mistake you can make with your Pinterest account is using a personal account to promote your business. By using a personal account to promote a business, you risk having your account permanently shut down. You can either switch a personal account to a business account, or start fresh with a brand new business account, depending on what’s best for you and your business. Converting an existing account has several benefits. You keep your current followers, the Pinterest algorithm already “knows” your account isn’t spam, and you have only one Pinterest account to deal with - no logging in and out every time you want to find a specific pin. On the other hand, opening a new account comes with its own benefits. Because you probably save a bunch of non-business-related pins on your personal account, most of your personal account followers are probably there for you, not your business. They may unfollow you when you start posting new, business related content. (Keep in mind that followers aren’t the main goal on Pinterest, but it’s still not great to lose a bunch of followers!) Creating a separate account can also help you keep your personal and business life separate. This can be an important distinction for some people, especially if you work from home. Another benefit can be that you won’t have to make all your personal boards into “secret” boards. Chances are that the things you pin on your personal account have little to nothing to do with your business. I use my personal account to pin things like recipes, craft ideas for my kids, holiday decor, and birthday party ideas. None of those things have ANYTHING to do with my business, and pinning those items along with my own business content could confuse the Pinterest algorithm. And lastly, sometimes creating a brand new, fresh account can be nice. I love setting up new accounts, and while it can be hard, starting from scratch feels good sometimes. 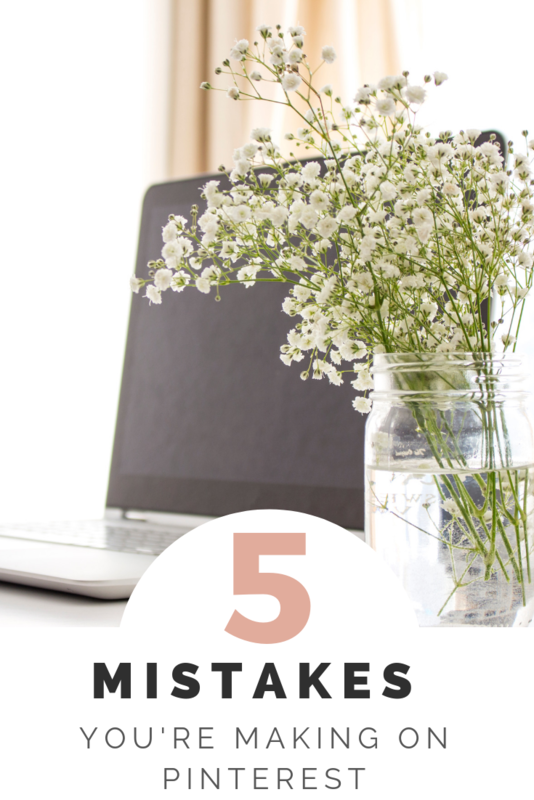 Thinking about getting started on Pinterest, but not sure if you want to go through the hassle of setting up YET ANOTHER account? I feel you! That’s why I started offering my clients Pinterest Setup services. Get your Pinterest experience started off on the right foot with a filled out profile, custom created boards, hand-picked pins, and a personalized strategy plan made just for your unique business needs. Pinterest is a search engine that runs on SEO - just like Google. In order to optimize your pins and boards for this SEO, you need to use good quality keywords. Keywords are what Pinterest uses to categorize and find content with the search bar. Without the right keywords, your content won’t be seen by your target audience. While keywords aren’t some magic wand that will make all your pins go viral, they are vital in making sure your content is seen (and pinned) by your audience. Make sure that the keywords you use are actually related to your topic - no “keyword stuffing”! Be strategic and direct. If you use the wrong keywords, your pins will show up in unrelated searches, won’t get any interaction, and will be “pushed down” in the algorithm. Check out this post for more help with choosing the best keywords for your pins. Even though Pinterest is technically a search engine an runs off of keyword-based SEO, the thing that really draws people in and makes them click is the image. A well-made graphic can be the difference between your pin going viral or being a total flop. Pinterest likes images with a 2:3 size ratio - longer than they are wide. Keep your text large, in an easy-to-read font, and with a clear message. Bonus points if you can include the word FREE somewhere on the pin! Whether you use a photo you took yourself, a stock photo, or simply a coloured or textured background, make sure it matches the theme of your post. For example, if you’re a food blogger, having a stock photo of a sunset may not be the best way to promote your awesome new Instant Pot recipe. And on the flip side, a random stock photo of a woman laughing at salad or photo of your (super adorable) child probably isn’t the best way to draw attention to a blog post on a more serious (and not child-related) blog post. The best way to make sure that your pins are consistently well made is by designing pin templates. Then, all you need to do is pop in the correct text and background each time you have a new blog post/product, and you’re good to go! If all your pins have a consistent look/feel, your readers will start to recognize your content on Pinterest and are more likely to share it with their own followers. One of the most important things with Pinterest is CONSISTENCY. Pinterest likes to see that you’re showing up and putting in the effort! Even pinning 5-10 pins per day is enough to show Pinterest that you’re committed. One of the easiest ways to make sure you’re pinning consistently is by signing up for a pin scheduler like Tailwind. 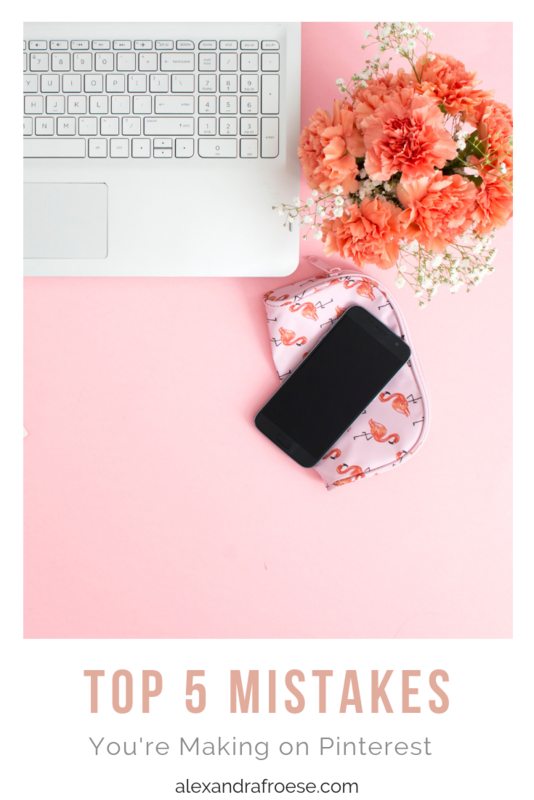 Tailwind is my personal favourite - it’s Pinterest-approved (meaning you’re not risking Pinterest getting upset with you for using it), it’s inexpensive, and it’s super easy to learn. There are other options out there, but honestly, I’m so happy with Tailwind that I don’t even know what the others are! I’ve written several blog posts about Tailwind - you can check them out here, here, and here. One thing I have to reassure clients about again and again is that Pinterest takes time. Unlike platforms like Instagram or Facebook, your posts probably aren’t going to get 1000 likes in the first hour (or day, or week). Pinterest is a slow-moving, long-term project. Even if you don’t see results right away, keep at it! After a while, all that effort will pay off and you’ll be happy you stuck with it. If you’re not quite sure how to decipher what your Pinterest Analytics are telling you, check out my super helpful post about it here. 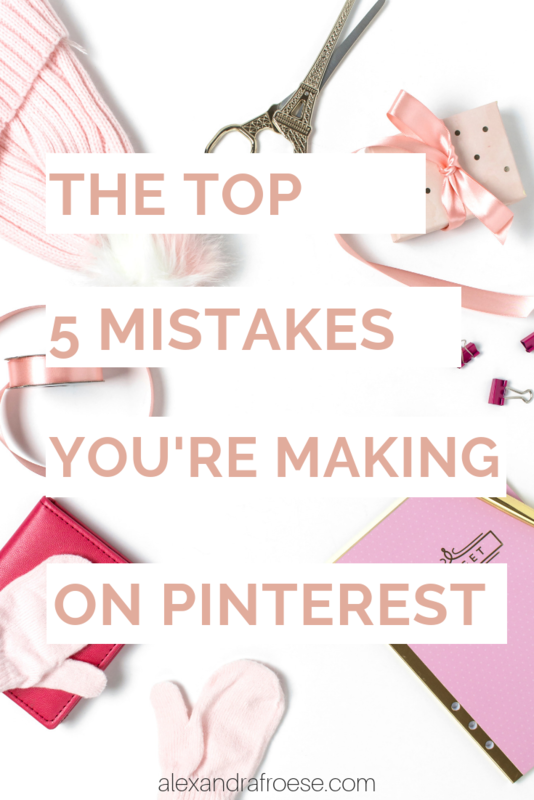 If you’re anything like I was when I started using Pinterest, you’re probably scrambling to fix at least 3 of the above 5 issues. Relax! We all have to start somewhere - and there’s no better time than RIGHT NOW to get started! 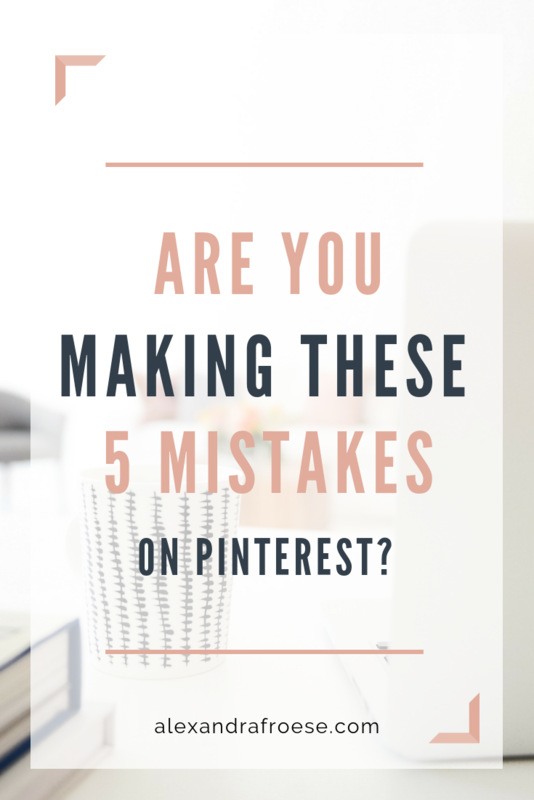 If you know you’re making some of these mistakes but you’re not sure how to fix them - or if you KNOW you’re not doing any of these but your Pinterest traffic still isn’t where you want it to be - get your 2019 started off on the right foot and book your Pinterest Audit right away! From your profile to your board names, from your Pin graphics to your daily pinning strategy - we’ll cover it all. We’ll talk about what you’re currently doing, what you should be doing, and how to get your Pinterest traffic from meh to WOW!